THE Martin Worthington will be there doing some sprays. Tony AIRSPEED will be pinstripping on the day so people can bring along something to be done. Hand shaping of timber Alia boards by Teal. Display and demo of GROWN timber handcrafted boards. And the usual mix of vintage surf boards, print, art and bric-a-brac from Jeff and others. Stefan's VINTAGE WALL OF JOY with only pre 1990's boards, you can put your boards on consignment for the day. 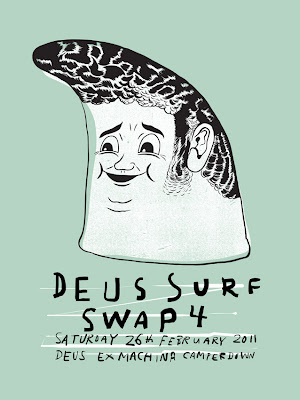 The famous Deus food emporium, lucky door prizes to be won etc.